Shravanabelagola lies prettily within a relaxing drive of approx. 180 km from Bangalore. That, it was just a short detour on our way back from Sakleshpur, sealed the deal for us. 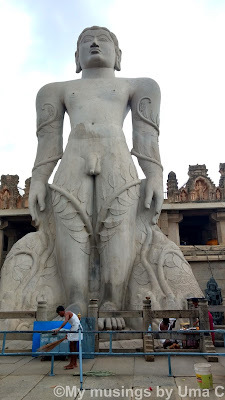 I had no clue about the history of the place apart from the fact there was a temple dedicated to king Bahubali. I was intrigued to know more especially having seen the eye-catching visuals from the movie. We broke off from the clean, wide highway somewhere after Hassan to meander along the narrow but well-laid roads through a small village. Green fields alternated between flashes of multi-hued dwellings on either sides of the road. Soon our destination, the temple, lay within our view. The husband claimed that he had been to the shrine when he was very young. Apparently, he didn't remember the details quite well. 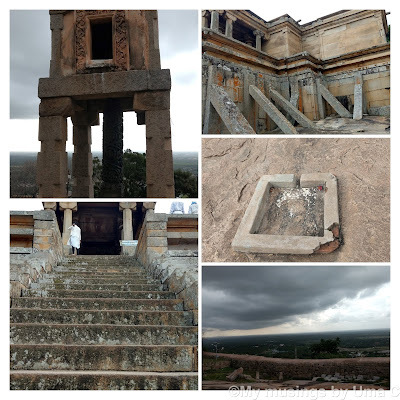 Especially, the fact that we had to set upon an arduous climb to reach the said shrine that was perched on the top of a steep hill! As you can see, the climb was a test of our stamina and strength. The first 200 odd steps were covered with the end in sight, so the strain got ignored. A periodical glance below after short spells of ascent left me awed with the beautiful sight and also a ticklish feeling at the pit of the stomach. 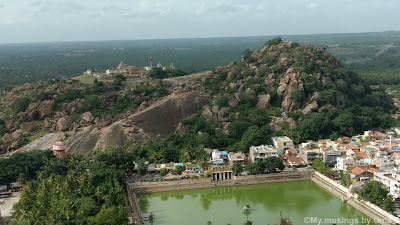 That's the Chandragiri hills (opposite the Gomateshwara temple on Indragiri hills) you're seeing. 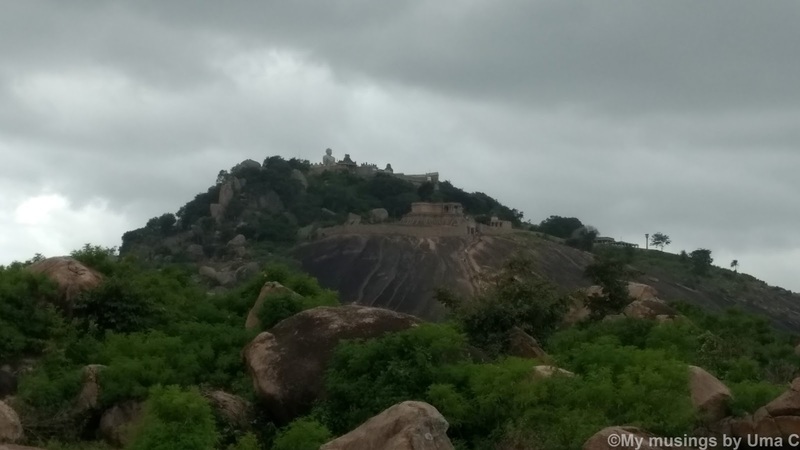 This is where Chandragupta Maurya breathed his last. Our first landing was here. This structure, seen from below, was what we thought marked the end of our efforts. 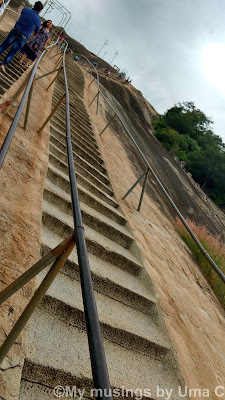 I remember telling myself, "Ok, now just a few more steps" But, alas, where was the huge idol hankering after which we had laboured this far up?! Turned out, it wasn't going to be an easy task being face to face with the mighty power. This structure was the Odegal Basti that enclosed three smaller shrines devoted to the main (Adi) tirthankara and two others. Upwards from here, the steps got larger and more cumbersome to lumber on. 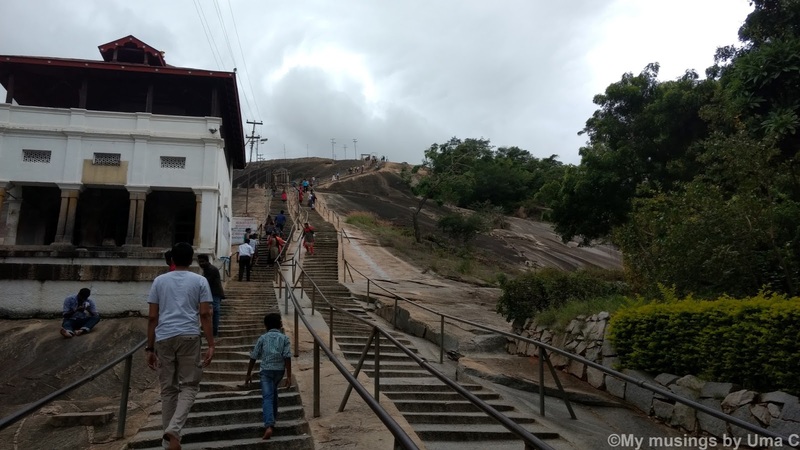 Two landings later, we finally entered the Gomateshwara temple or the sanctum where the massive idol of Lord Bahubali was housed. 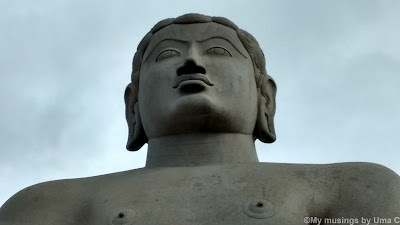 Gomateshwara or king Bahubali was younger son of the the first tirthankara, Vrishaba Deva. He won the war of the throne against his elder brother, Bharata, but later renounced all power and wealth to become a Jain ascetic. (Also, the premise on which the famous movie, Bahubali, is based). And, yes, it was about 650 steps up until here! The Gomateshwara or Bahubali statue stands at an imposing height of 58 feet and 8 inches and is carved out of a single granite stone. It is considered the world's largest monolithic statue. A maha-ashtabhishekam is held once in 12 years that attracts large crowds from all over. You can read more about the history here. Isn't that awe-inspiring? Such magnificent pieces of history and handiwork have a way of putting us mortals in place. Look at the chiselled features on the mighty sculpture. And, how well it has stood against the vagaries of nature! Our temples, architecture, and history always leave me wonder-struck; I marvel at the wisdom of the powerful kings, the skill and talent of the local artisans, the stories of their lives underlined with deep morals; how they have left us with a precious legacy of philosophy and spiritualism! Why don't we learn more of these in our history lessons? Field trips like these will help to cultivate much pride in our heritage and culture; something that is starkly and sadly missing! Have you been here? What are your memories from the trip? Do share. I'd love to hear. Lovely.....650 steps! Good you didnt know beforehand! lovely pics Uma! Steep climb it seems to be. Thanks, Vibha. Yes, it was quite steep! I know, Rohini. Aren't they simply great? So many great temples in the South on my to-visit list! Wow! 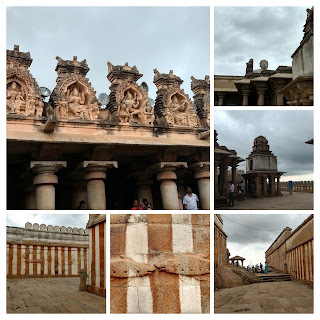 I have been wanting to go to Halebidu and Shravanabelagola for a long time now. I should just stop being lazy :) thanks for sharing and I am going it plan it very soon. You should, Parul. They are truly amazing in every way! Reading this post now has me planning my future vacations :-D Thanks for that push! Do visit Bangalore some time, Divya!